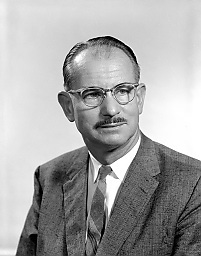 American physicist Edwin M. McMillan discovered the first transuranium (heavier than uranium) element, named neptunium, in 1940, working with Philip Abelson (1913-2004). In the same year, working under Glenn Seaborg and with Joseph W. Kennedy (1916-57) and Arthur C. Wahl (1917-2006), he discovered plutonium. Due to national security concerns, no public announcement of these discoveries was made until several years after the end of World War II. McMillan and Seaborg shared the Nobel Prize for Physics in 1951. As a teenager McMillan was fascinated with science, and audited classes at California Institute of Technology, which was near his home. He studied under Edward Condon, and his first scientific paper was on the topic of x-rays, and co-authored by Linus Pauling. He worked on the development of radar during the early months of World War II, and later joined the Manhattan Project that developed the first atomic weapons. In 1945 he introduced the theory of phase stability, which made possible the development of the next generation of high energy particle accelerators. His father-in-law, George Blumer (1872-1962), was dean of the medical school at Yale. His sister-in-law, Molly Blumer (1910-2003) was married to Nobel laureate Ernest Lawrence, namesake of the Lawrence Berkeley National Laboratory where McMillan spent most of his career, and which he headed from 1958-73, after Lawrence's death. His interests beyond science included exploring the Borrego Desert and growing Venus Fly Traps. He was also proud of his Scottish ancestry, active in the formation of the Clan MacMillan Society of North America, and served as its first President in 1958.